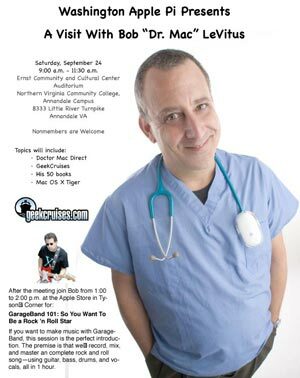 Bob "Dr. Mac" LeVitus is our scheduled guest at the September 24 General Meeting. LeVitus will talk about his experience with Dr. Mac Direct, an online tech service. Assisting "Dr. Mac" get started was none other than Ted Landau, s famous for his affiliation with Macfixit.com. He is the author of Sad Macs, Bombs, and other Disasters. Dr. Mac is also a Mac book author many times over. His books discuss various troubleshooting and usage tips for many of Apple's past and current software as well as third party software that runs on the Mac. Come to the meeting for an entertaining get together to learn what life is like from the point of view of one of the community's finest gurus. Remember to check the Pi webpage as the date nears to see if there are any changes.